President Devorah Lieberman was invited by Beasley to say a few words before the reception commenced. “Unsung Requiem: Lost Then Found” consisted of 40 works based on historical and personal narratives, from honoring significant historical figures to preserving the unique challenges of her ancestors, Beasley’s voice is heard throughout. “Class of ‘33” is one of the pieces in Beasley’s art show to honor her stepmom’s graduating class from Wilberforce University, the first historically black college in the nation. 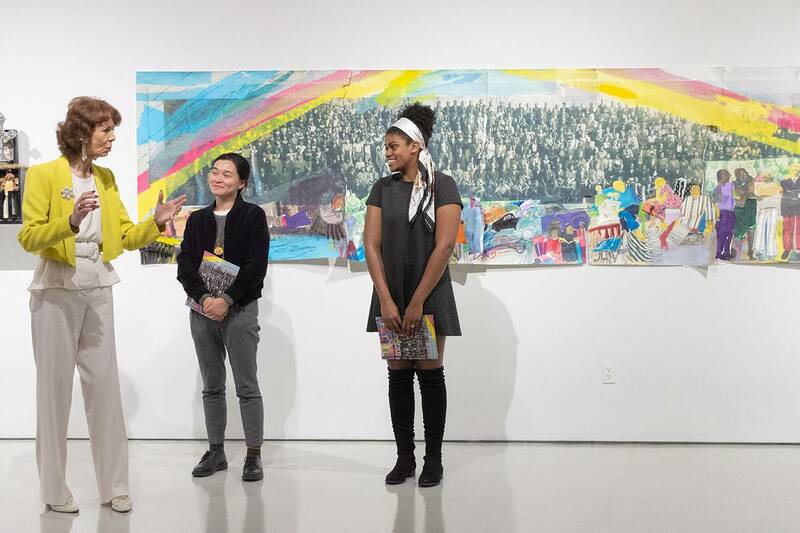 The painting included an overarching colorful rainbow overseeing the hundreds of graduating students sitting in the middle of the painting. Toward the bottom, railroad tracks can be seen along with painted figures of different colors. Beasley gave Lao and Glothon personal advice about art throughout the process. Glothon said that although she works with the art department, this experience was different than anything she has done before. Beasley uses a variety of vibrant colors along with different textures, fabrics, objects, and paper to create her pieces. While some are portraits, such as “Sunset on Laguna Lady,” where a woman is sitting on a white chair with the sunset as her background, other paintings are more abstract, such as the “Orchid Sun” collage, two paintings of white orchids with a swirl of pink, purple and blue backgrounds along with a mix of patterned paper. Along with paint, Beasley places objects on the paintings themselves, such as buttons, stamps, coins, cardboard, jewelry and even a shoe in order to provide a 3D experience for her audience. Similar to her paintings, each piece of 3D art represents yet another part of her life. Dion Johnson, director of galleries, explained the manner in which Beasley’s art was placed and the reason behind it. Simultaneously, Beasley placed dark colors, such as grays or blacks, on another wall to represent the quieter moments of her life. Each art piece was placed intentionally, so that there was almost a domino pattern, where one piece led to another. Morgan Lee, a junior anthropology major, attended the reception and artist talk for her SOLVE class and said it was more interactive than other events she has attended. Jon Leaver, art history professor, said he was captivated by the diversity of materials Beasley used within her art. Beasley’s art will be displayed through May 16 in the Harris Gallery. Alondra Compos can be reached at alondra.compos@laverne.edu.